The Jewel Tone Purple Leek by Kershaw Knives retains all the superior slicing features signature to the Leek-series folding pocketknives in a new, fan-favorite color. 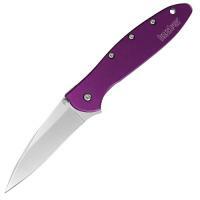 This impressive compact knife features a fade-resistance, scratch-resistant dye that has been permanently bonded to the anodized aluminum handle, so it'll never lose its lush purple hue. The modified drop-point blade is constructed of sharpened, high-performance steel with a bead-blasted finish. The tip is extra slim, improving piercing action or handling with small precision work. The blade is released using Kershaw's proprietary ambidextrous, SpeedSafe® assisted system--either pull back the flipper or push the thumbstick to release the blade. The Leek's blade stays open using a locking liner and, when you fold it back, the tip-lock slider keeps the blade closed. Carry the Leek either tip-up or tip-down thanks to its reversible pocket clip, or attach it to a lanyard utilizing the pre-drilled hole in the handle.